One of the most expansive areas of alpine tundra in the United States, beautiful forests, and mountain meadows dominate the landscape at Rocky Mountain National Park. 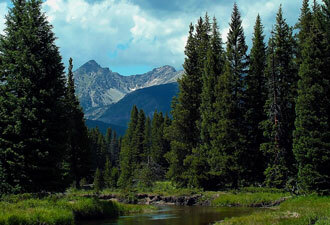 The park preserves one of the most scenic stretches of the southern Rocky Mountains. One-third of the park is above treeline, where tundra predominates. This is a major reason the area was set aside as a national park in 1915. Our centennial celebration is right around the corner! Cake anyone? This incredible place encompasses 416 square miles with diverse habitat at all elevations. There are 114 named peaks above 10,000 feet. We certainly have altitude! During summer months, the Trail Ridge Road takes visitors along the highest continuous paved road in America, reaching an elevation of 12,183 feet. Most will stop at the Alpine Visitor Center, 11,796 feet above sea level. The views from Trail Ridge Road are literally breath-taking, whether you are looking toward the towering Continental Divide, 14,259 foot Longs Peak, or the Never Summer Mountains. You can experience the park in so many wondrous ways. With over 350 miles of trails, the park is a favorite destination for hikers, cross-country skiers, snowshoers, climbers and horseback riders. Most of the park was designated as wilderness in 2009. Backcountry adventure awaits! Diverse wildlife includes elk, deer, bighorn sheep, black bears, mountain lions, coyotes, moose, 260 species of birds, and much more. Each fall, when the aspen are in full color, tens of thousands of visitors come to the park to witness the annual rut of the elk. From the montane ecosystem in the lower levels to the high alpine tundra ecosystem, there are marked differences in wildlife and vegetation. Openings in the forest, meadows, and glades produce summer wildflower gardens, where the Colorado blue columbine reign. At the edge of the tundra, trees are wind-sculpted, reaching the point where they no longer grow. Many of the park’s tundra plants are those that can survive in arctic regions. Scores of glacially carved alpine lakes, over 140, invite park visitors to enjoy a moment of solitude in a pristine setting. 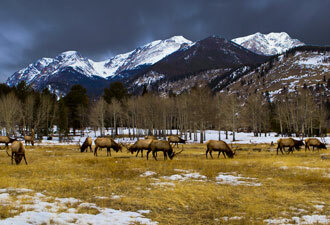 From its valleys to its mountaintops, Rocky Mountain National Park encompasses many worlds. ITo better understand, appreciate and protect this national treasure, the National Park Service and National Geographic Society are teaming up to host a 24-hour BioBlitz species count and a two-day Biodiversity Festival on August 24-25, 2012. Part scientific endeavor, part festival, and part outdoor classroom, the event will bring together leading scientists and naturalists from around the country, thousands of visitors, and hundreds of students. Together they will explore the park, observing and recording as many plant and animal species as possible. 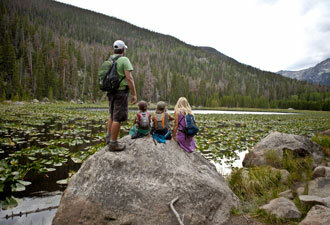 Families with children will find lots of activities beyond hiking and adventuring in the wilds of Rocky Mountain. Ranger-led programs include summer campfire talks and astronomy viewings. Kids can take part in the park’s popular Junior Ranger program. Experience wilderness, wildlife, and wonder at your next visit to Rocky!